YouTube site created for event (screen-grab). “Most people live in or near cities today. What is you(r) city like? Cities are built, destroyed, transformed, dreamed about, branded, commodified, bought and sold. Some cities have soul. Some cities attract people. Some cities are machines, some are gardens, some are cemeteries. Some are prisons. What is city life like in different societies? In different cultures? In different climates? Under different degrees of freedom? Under different economic circumstances? In different neighborhoods? In different kinds of buildings? In different public spaces? On different streets? In different states of mind? What makes urban life enjoyable? Unbearable? Necessary? Viable? Questionable? Unquestionable? Problematic? Inevitable? Attractive? Repulsive? Boring? Intense? Delirious? 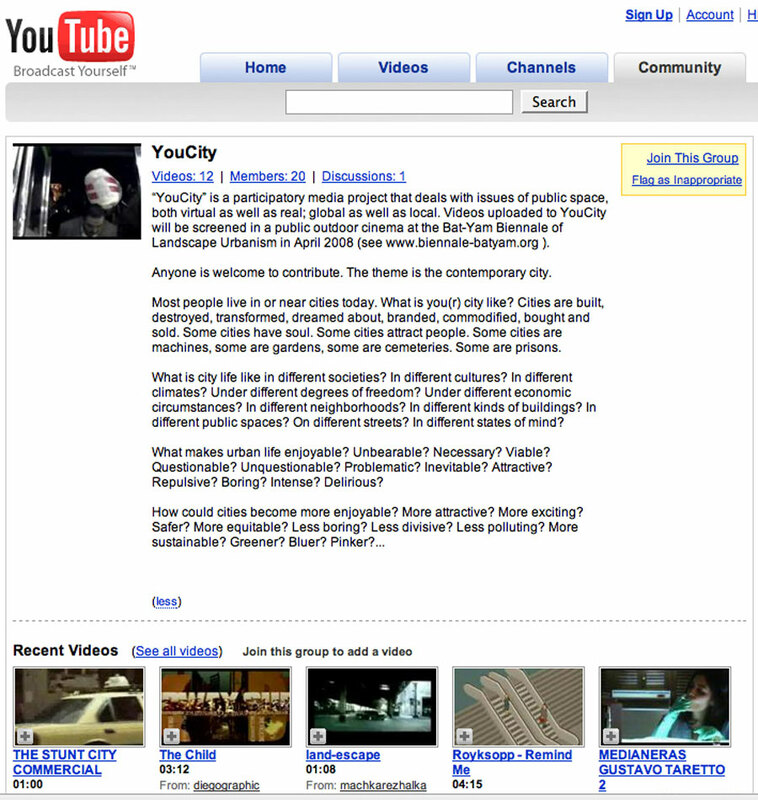 “YouCity” attempted to open up a public space that was both real and virtual, as well as local and global. It also attempted to open up a democratic channel of communication in a conflictive geo-political region. According to the ancient Greeks, the space of democracy—the agora—was never to exceed the dimensions over which a human voice could be heard. Human communication is thus intrinsically a part of the very idea of democracy. As modalities of communication changed with technological developments such as the invention of the printing press, the radio, the televised signal, and the internet, so did the architecture of public space–to the point that it has been said more than once that physical public space has been rendered obsolete by electronic communication media. One of the criticisms that has often been made of developments in mass communication technology is that they have made the direction of communication increasingly uni-directional from producers of content—often large, private telecommunications corporations not without their business and political interests—to passive consumers. However, the “Web 2.0”—internet websites where anyone can upload as well as download content—is changing this, creating forms of communication that are more multi-directional and therefore more democratic. “YouCity” sought to concretize this form of multi-directional communication in a makeshift public space as opposed to an existing one. The site is a leftover space at the back of a a privately owned, semi-public interiorized structure dedicated to consumerism; a space situated at the end-cycle of an especially manipulative and economically interested form of one-way communication: advertisement. “YouCity” reclaimed this space, albeit temporarily, in favor of dialogue, participatory entertainment, and interactive creativity. Wish I had been aware of this sooner…sounds like a great concept in theory.